For decades, Clarion has been an innovator in the field of Human Machine Interface (HMI). Integrating the basic principles of an effective HMI system – Detection & Action – Infoseat™ provides a simple yet effective solution to warn drivers of dangers ahead while driving. The system utilizes two-way cloud and intra-vehicle communication to monitor both the in-cabin conditions, including the state of the driver, as well as external environmental developments, to alert the driver with audio and vibration. InfoSeat™ sensors and internal camera monitoring system detect driver distraction, as well as physical state. 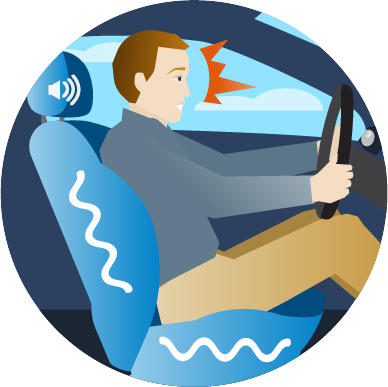 InfoSeat™ vibrates and projects localized audio from headrest to help reorient driver and inform him of a situation that requires his attention.